Dr. Roger Leir: Alleged alien implant analysis/removal. Robert Hastings: UFOs and Nukes. Budd Hopkins (Intruders Foundation): Alien abduction. Nick Pope: MoD UFO files. Jesse Marcel, JR.: Witness to Roswell debris. Ted Phillips (CUFOS): UFO traces. Phillip Imbrogno: Hudson Valley UFO researcher. Note: Dates and info may vary from site to site regarding a UFO cases on the internet. It's always goood to cross-check, look for original witness testimony. The UFO Examiner with Roger Marsh has newer UFO cases from MUFON. The National UFO Reporting Center. Sightings are organized in shape category along with the number of sightings in the specific category which gives you a good indication on what types of craft people are reporting. A good overview of UFO's. Although the author may be jumping to conclusions in trying to make sense of it all. 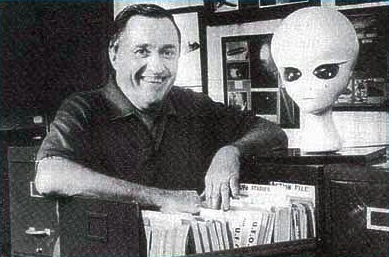 Note: howstuffworks uses UFO photos for decorative purposes that are unrelated to a case on a page. Lots of UFO and close encounter cases with photos. Cross-check info with other sites. UFO info from NICAP. Cross-check info with other sites. UFO Evidence has vintage cases taken from the APRO Bulletin.